Raimuni Singh of Ichkela in Jashpur district had a rough childhood. She had two brothers and one sister. Her elder brother was a drunkard and he would always create trouble at home. His tantrums had caused a lot of disturbances in the family and Raimuni faced a lot of trouble studying. She always felt like leaving that environment and escaping to some other place. She wanted to go away from her family and pursue higher studies. But her dream of higher studies remained unfulfilled because of lack of support from the family. She had to quit studies after 10th standard. Though she quit school she did not stop learning. She started to learn stitching work. That was the time when she met Anuranjan Tirki. She found her soulmate in him and decided to start a new life with him. Soon she left her home and started her own family with Anuranjan. Anuranjan grew up in a family with four brothers and a sister. It was not a well to do family and they had to struggle to meet both ends meet. The children were not able to pursue studies because it was not affordable for them. However, Anuranjan was determined to do something on his own and therefore he studied up to 12th standard with great perseverance and hard work. He worked at households to support his studies. He had also learnt tailoring work and by the time he separated from his family he was a skilled workman. After getting married, Anuranjan and Raimuni moved to Hathgada and started working hard together so as to be able to support themselves. The couple was determined to make their lives better. After some time they even bought a small plot of land and built a house of their own. When the Bihan scheme was introduced in the Hathgada area, Raimuni became an active member. Bihan is a scheme of the Chhattisgarh government under the National Rural Livelihood Mission that supports rural women in developing various skills in order to make them self-reliant. Soon after being associated with Bihan as an active member, she was chosen for FLCRP. 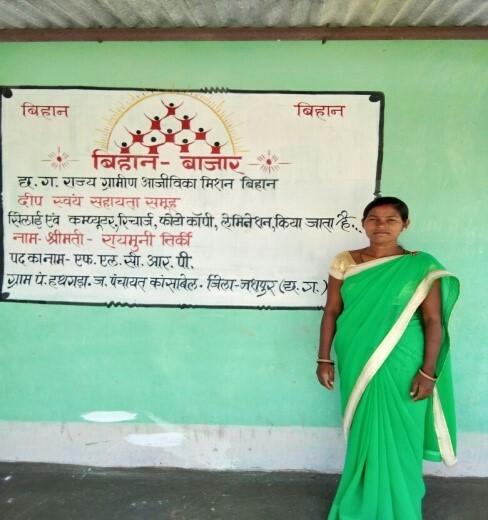 Since 2016 she became associated with Deep Self Help Group. She looks after the book keeping of the SHG. Raimuni today manages other works like taking photo printouts from computers and doing phone recharge besides sewing work. 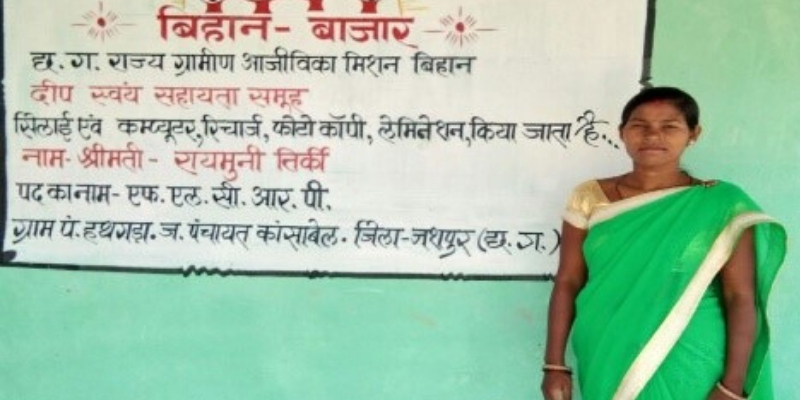 For Bihan, she looks after three panchayats. She looks after the functioning of 25 SHGs in Barjor, 23 SHGs in Hathgada and 42 SHGs in Tangargaon. She works with a team of 12 people. She has recently taken a loan of 36 thousand rupees to buy an e-rickshaw. With that e-rickshaw she makes 700-800 rupees daily. Her husband has been very supportive since the very beginning and he has always encouraged her to work. But she feels that without Bihan, all the progress she has made would not have been possible. She is grateful that the Bihan scheme was introduced in the state. “Whatever I have been able to do is because of Bihan.”, she says.